An executive search involves a complex process that requires a substantial investment of your time and resources. When you hire a search firm, you’re entitled to receive a high level of service. But what is the difference between a professional, reliable service and a lower quality of service? What are your rights and obligations as a client? Above all, how do you know when you have received excellence in client service? Search firms will answer most - but not all - of these questions in the consulting contract. Therefore, the more you know about the ins and outs of working with search firms, the better your chances of achieving a successful search and receiving full value for your investment. 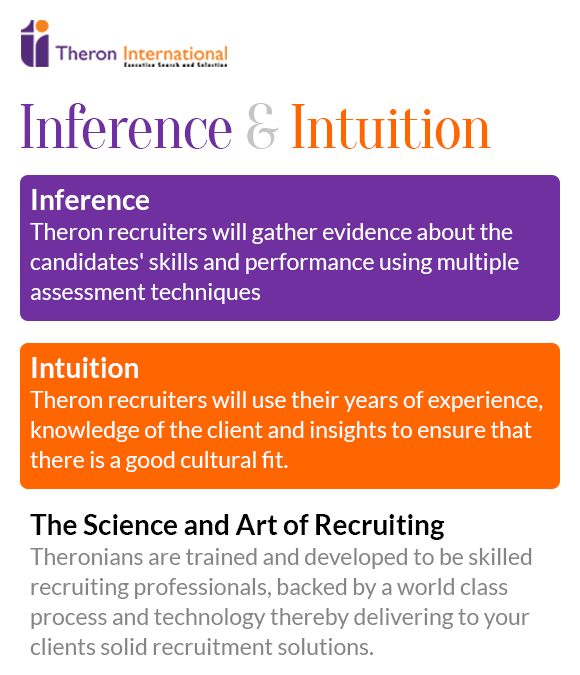 In the belief that well-educated clients always lead to better client/consultant relationships, Theron International subscribes to the Association of Executive Search Consultants (AESC) “Client’s Bill of Rights” & this document is taken from its online resources. The executive search firm shall provide you with an accurate and candid assessment of its capabilities to perform your search. Not all search firms offer the same services, but they should all operate in line with the highest professional standards. In addition to the obvious differences in size and manpower, search firms also vary in their areas of expertise, their knowledge of and contacts within various industries, and the skills and experience levels of their search consultants. This requires that you provide a full and accurate description of your organization, its business needs and culture, the position to be filled, and your criteria for the ideal candidate. If the search firm cannot handle your assignment, it should explain why and then refer you to another firm better equipped to meet your needs. The executive search firm shall tell you who will conduct the search. In addition to the consultant who generates the business relationship, there may be a team of professionals who will handle the search assignment. It is certainly within your rights to ask for and to receive full and open disclosure regarding the consultants and their ability to successfully handle the assignment, as well as the resources the firm has available to support the consultant/team working on your project. The executive search firm shall provide a high-level consultative relationship. Do not expect a 50-page market research report. However, the search firm should give you a reasonable overview of market conditions and the general perception of your organization in the marketplace for talent. The executive search firm shall hold your information in strict confidentiality. By its very nature, an executive search requires you to divulge highly sensitive information about your organization. The search consultant must treat any and all information you give them with the utmost confidentiality. The executive search firm shall demonstrate a clear understanding of the position, the company and the objectives of the search. Good search firms will do more than just feedback the job description you present them. They will proactively help you develop, modify and refine your own understanding of the position. To help with this critical step, give your search consultant access to all those who participate in the selection process and encourage them to provide full disclosure regarding the position to be filled. Because the job description represents the bedrock of a successful search, you have a reciprocal obligation to notify the consultant any time circumstances (either internal or external) require a change in the position or the type of person you’re looking for. Be aware that a major change in search specifications may require a change in fees. The executive search firm shall provide you with regular, detailed status reports on the progress of the search. The search firm should update you regularly, either by phone, fax, e-mail, written report or some combination of all four. Let your consultant know your preferences. The executive search firm shall present qualified candidates who fit the position and the culture of your organization. In presenting candidates, either individually or in a “shortlist,” you should expect the consultant to discuss the interviewing arrangements and other issues that can affect the critical interviewing process. Immediately after you have interviewed candidates, your search consultant should solicit your comments and feedback and help you conduct comparative candidate assessment and analysis. The search consultant should also discuss and agree with you how the process of reference and background checking will be conducted. This should cover references regarding competence and suitability for the job, verification of employment history and educational credentials and other issues such as criminal checks. Your own organization may wish to conduct the background and employment history checks directly or through a third-party investigator.Whoever conducts this process, it is important that it should be thoroughly completed and to your satisfaction. If it becomes apparent that the search will take considerably longer than expected or that it may not yield an acceptable range of candidates, the consultant should inform you as soon as possible and discuss alternative courses of action. The executive search firm shall help you negotiate with the final candidate, representing both parties with skill, integrity and a high degree of professionalism. Remember that your candidates are also very busy professionals who have sacrificed valuable time to talk with you. Furthermore, they did not solicit this opportunity; it was presented to them. The executive search firm shall provide you with a clear understanding of its replacement policy and other unusual situations that may arise during and after the search. The executive search firm shall provide you with a reasonable level of follow-through after you have hired the candidate. Seemingly successful placements can sometimes fall apart during the transition period. As a result, the consultant’s responsibility does not end when the candidate accepts the offer. Instead, the consultant should stay in contact with the new hire as long as necessary to ensure a smooth transition and help them settle into the new position. Above all, the consultant should make sure that you are fully satisfied before considering the search a success and concluding the assignment. Given the importance to your organization of filling the position with the highest quality candidate, you have every right to expect the highest level of service. Remember that by working with a retained executive search firm you have entered into a consulting partnership. Take a proactive approach to managing the relationship. Do your homework, provide full and accurate information regarding the position and the ideal candidate, and where appropriate put these understandings in writing. Set very clear expectations up front in terms of how you and the search consultant will work together. Keep the lines of communication open on your end, and stay in regular contact with your consultant until the assignment has been completed to everyone’s satisfaction. If at any time during the search your consultant doesn’t seem to understand the nature of the assignment, fails to provide ongoing feedback and progress reports, fails to present a range of qualified candidates or doesn’t represent your firm in the manner you wish, express your dissatisfaction immediately! Now that you know your rights, it’s up to you to hold your search firm to the high standard of service that you expect.